Sorry about the long time, our computer is slightly broken, and I have been crazy busy with life. So... there you have it. For a quick recap, we have discovered that Keith has many talents. Right now one of his favorite things to do is dance. He has figured out how to work the record player (and when I say work, I mean turn on) and does so every chance he gets. Lately I have been listening to Abba because, well, they are a perfect group to clean to. I think Abba is his favorite group right now. He turns it on and just dances through the whole song. When there is silence in between the songs, he thinks it has turned off, so he will turn the volume even higher and then the music starts again, and he dances through that whole song... He has now danced to Abba's Greatest Hits... completely! Jeffrey suggested I play some Beach Boys for Keith to dance to, but we don't have any of their records. Abba it is, much to the chagrin of my hubby. Keith has also decided he loves when Mommy cooks. If he uses enough baby charm and stealth he can sometimes get the food away from her, and then he is living the high life. I don't know, I kind of feel like a bad mother when I laugh or run for the camera. He is just so funny! One of these days I need to start disciplining him, but he is just too cute and I want to catch every second of it. He found the cake, and enjoyed every second of it. On another note, I just saw the creepiest movie ever. 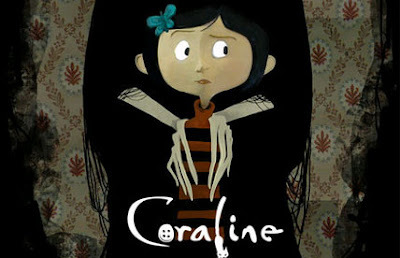 Coraline is a very interesting movie, but I was really saddened by the portrayal of the mother. I have recently noticed their negative roles (or lack of roles completely) in moves of late. Coraline was no different (and it was too creepy for children. It should have been a PG-13). For a quick movie review I would never take children (there were little kids who kept saying "Mommy, I'm scared" through the whole movie. Sad! ), but it is good for a Friday the 13th (this Friday!) or Halloween. And the 3D was super cool. It did teach me about neglect. The poor girl's parents were so busy, they kept putting her off and sending her away. I hope I never do that with my son, and I hope he is very happy forever. That is why I have spent all morning playing with him and not cleaning, and laughing, and having the best time of my life listening to my little boy's laughter. Oh I'm sorry you were disappointed in the film. But at least you learned that lesson from it! I learned that lesson from the way I was raised. I don't think it should have been pg-13... keep in mind that means a 12 year old kid can't go see it without his parents. I think your standard-issue 10 year old could do just fine unsupervised in that movie. People need to remember that PG means "parental guidance suggested" and actually find out about the movies they're taking their bedwetting little rugrats to see. Especially with the internet and everything these days, it's so easy to find out about a movie. Besides, kids need a good scare every now and again... otherwise they'll all go abandoning their families for alternate worlds!